•Deliveries to customers commence March 2019; ÚK prices start from £237,000McLaren Automotive, the British manufacturer of luxury, high-performance sportscars and supercars, is expanding its Super Series product family with the introduction of a second new model under the £1.2bn Track25 business plan and its most accomplished convertible supercar ever: the new 720S Spider. Revealed online today, December 8, 2018 and available to order with immediate effect, the new 720S Spider delivers the exhilaration of open-air driving and levels of day-to-day usability unseen in the convertible supercar class. The design foundations of the new McLaren Spider are the seamless and organic forms introduced in 2017 with the 720S Coupé. Combining to maximise downforce, minimise drag, enhance powertrain cooling and optimise aerodynamic performance, these shapes produce an overall appearance akin to a futuristic sculpture, formed by the air that flows over, under, around and through it. A new, electrically actuated Retractable Hard Top (RHT) is seamlessly integrated into the design, as are new buttresses. Like all McLaren cars, the new 720S Spider has a carbon fibre structure at its core, in this case designated Monocage II-S. The strength, rigidity and light weight of the McLaren Monocage is the base for the dynamic excellence for which McLarens are renowned. The Monocage II-S is a development of the Coupé ‘s Monocage II, without the central ‘spine’ running front to rear above the cabin. The rearmost section of the upper structure is also unique to the Spider, to accommodate the Retractable Hard Top; additionally, the header rail across the top of the windscreen has been revised, to integrate the central latching mechanism. McLaren’s engineering ingenuity, underpinned by the inherent strength and rigidity of carbon fibre, means that despite the removal of the fixed roof there is no need for additional strengthening; even the unusually slim but incredibly strong windscreen A-pillars first seen on the 720S Coupé remain. To provide enhanced rollover protection for occupants, fixed carbon fibre structural supports are integrated into the rear of the Monocage II-S, additionally providing the main anchor points for the roof system and the seatbelts. In the first-generation Super Series, steel supports featured and the switch to carbon fibre has contributed to the Rollover Protection Structure (ROPS) in the 720S Spider being 6.8kg lighter than in the 650S. Overall, the new 720S Spider is just 49kg – or less than 4% – heavier than the 720S Coupé. The increased weight is primarily associated with the RHT and tonneau system. With a lightest dry weight of 1,332kg the 720S Spider is comfortably the lightest car in its competitive set, at 88kg less than the 1,420kg dry weight of its closest rival. The low weight is the foundation for the dynamic, performance and efficiency benefits that McLaren is so adept at exploiting for the greater enjoyment of its customers. The canopy-like design of the 720S Coupé is recognised for the sense of 360-degree vision it provides, allowing light to flood into the cabin and setting a new benchmark for visibility. This philosophy of unrivalled vision is central to the second-generation Super Series and the new Spider moves the game on again, with unique, glazed flying buttresses further aiding driver visibility as well as adding visual drama to the car. To accommodate the Retractable Hard Top, the Monocage II-S features a new carbon fibre upper structure engineered to sit as close as possible to the air charge coolers and intake plenum. This maximises luggage space; there is 58 litres of stowage available under the tonneau cover with the roof raised. The tonneau cover also sits lower than that of a 650S Spider – again by 25mm – extending visibility by 7.5m in length. The 4.0-litre twin-turbocharged McLaren V8 engine that powers the 720S Spider is unchanged from the Coupé. Mid-mounted for exceptional handling and purity of response, it produces 720PS and 770Nm and –given the lightest-in-class weight of the 720S Spider and resulting power-to-weight ratio of 540PS-per-tonne at lightest dry weight – it is no surprise that performance is extreme. Acceleration is nothing short of phenomenal, with 0-100km/h (0-62mph) covered in 2.9 seconds and 0-200km/h (0-124mph) achieved in just 7.9 seconds – just 0.1 seconds off the pace of the Coupé. The standing quarter mile sprint is dispatched in 10.4 seconds – again, only 0.1 seconds slower than the Coupé – and where conditions allow, the 720S Spider will continue accelerating to a Coupé-matching top speed of 341km/h (212mph) with the roof raised. Even with the roof lowered, maximum speed remains extraordinary at 325km/h (202mph). The minor variations in performance arise from differing aerodynamics and the additional 49kg the Spider carries. The 720S Spider has the same dramatic ‘eye sockets’ cut deep into the front fenders and double-skinned dihedral doors immediately obvious on the Coupé – just two of the body design elements that play an integral role in delivering the extraordinary aerodynamic efficiency and balance the 720S possesses. Beyond this, the front splitter and contoured bonnet, for example, dictate and control the airflow through, over, around and under the rest of the vehicle, while behind the front splitter, the underfloor aerodynamics have been revised to work in harmony with the new rear bodywork and full-width active rear spoiler of the 720S Spider. The rollover protection technology brings an advantage in respect of size as well as weight, the compact system having allowed McLaren’s design and engineering team to create incredibly slim tonneau buttress. This improves over-the-shoulder visibility for the driver and contributes to a sensation of exceptional space overall, while also increasing aerodynamic downforce. The Retractable Hard Top (RHT) of the 720S Spider is a completely new design, with a one-piece, carbon fibre roof panel as standard. The hardtop maintains the distinctive silhouette and aerodynamic purity of the 720S Coupé and provides a full carbon fibre upper structure when the roof is closed. 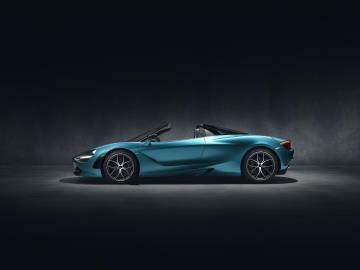 The folding mechanism for McLaren’s new RHT is electrically rather than hydraulically driven and the system is the fastest-operating convertible roof in the supercar class, with the retractable hard top lowered or raised in just 11 seconds – six seconds quicker than the 650S Spider. The combination of e-motors and the strength and light weight of the carbon fibre RHT enables a maximum vehicle speed during operation of 50km/h (31mph) – a significant increase from the 30km/h (18.5mph) of the 650S. With these performance statistics, it is no surprise that McLaren has registered three worldwide patents for the roof system. The new RHT is twice as quiet in operation as the first-generation Super Series convertible, with occupants experiencing additional sound on par with background noise in a quiet library when the roof is operating. This serenity is indicative of exceptional refinement overall, with noise levels inside the cabin of the Spider with the roof raised measurably less than those experienced in a 650S Coupé – true testament to the engineering precision pursued throughout the development of the second-generation Super Series. A rear window lowers automatically when the RHT is opened, moving to the optimum position to minimise airflow intrusion into the cabin. The window is also independently controllable, allowing occupants to lower it when the roof is closed and invite the sound of the powertrain into the cabin. The fact that the buttresses at their highest point are 25mm lower than those of a 650S Spider allows air to flow over the cabin, reducing turbulence to a bare minimum. Owners wanting to experience the open-air nature of the 720S Spider even with the roof closed can specify a carbon fibre-framed, glazed RHT option to allow even more light into the cabin if they so choose: the glass is electrochromic and can switch rapidly between a transparent or tinted state at the touch of a button. When the ignition is off, the glass reverts to its tinted setting, helping keep the cabin of the 720S Spider cool during hot days. The electrochromic technology has a memory function that recalls the previous setting selected when the vehicle is next started. The interior is the same welcoming and luxurious supercar cabin enjoyed by 720S Coupé drivers. Opening a door – which is now a frameless design to accommodate the RHT system – provides access to a truly sophisticated environment, with an extraordinary perception of space and the finest materials in evidence. A new door hinge system and gas strut position was possible without issue because from the outset the 720S programme included both Coupé and Spider bodystyles. A centrally-mounted 8.0-inch high-resolution Central Infotainment Screen remains the primary hub for the vehicle’s functions. The interface displays audio, media, navigation, climate control and other convenience features, with all the key applications shown on a vertical carousel as well as being available via quick-access ‘hard’ keys below the screen. The dual-zone climate control and air conditioning system has been recalibrated for the 720S Spider and is able to detect if the RHT position changes from raised to lowered or vice versa. The temperature and airflow is automatically adjusted, warming or cooling occupants according to the ambient settings already selected by increasing airflow into the cabin and moving more air to the footwell or upper cabin areas. The active rear spoiler, which automatically activates to either decrease drag or increase downforce and also acts as an airbrake to enhance vehicle balance under heavy braking, can rise at lower speeds and to a higher position overall in the Spider application, optimising downforce and balance to ensure that performance and driver engagement is on par with the 720S Coupé. And while the rear spoiler is identical on both Coupé and Spider, the deployment mapping is bespoke to each bodystyle, the aero settings differing depending on whether the Retractable Hard Top is raised or lowered and the vehicle electronics being automatically aware of which condition it is in. McLaren’s Proactive Chassis Control II hydraulic suspension – already renowned for challenging convention by delivering the usually incompatible combination of precise body control and a compliant ride – is complemented by an electro-hydraulic steering system widely acknowledged for providing exceptionally pure precision and feedback. As with the Coupé, a Spider driver can choose between three Handling modes – Comfort, Sport, or Track – each focused on a different driving experience according to personal preference and conditions. These proven attributes combine to ensure that the 720S Spider possesses the same depth of dynamic abilities and breadth of capability as Coupé ably demonstrates. A new 10-spoke, Lightweight forged alloy wheel design has been developed for the new Spider. Tyres are Pirelli P ZERO™, designed in conjunction with McLaren Technology Partner, Pirelli, to provide the optimum balance of performance, grip, handling and comfort over a wide range of road conditions. A more track-focused Pirelli P ZERO™ CORSA tyre can be specified instead, at no additional cost, while Pirelli SOTTOZERO™ winter tyres and Pirelli TROFEO R ultra-high performance tyres are available from McLaren retailers. The new 720S Spider is available in the same three specifications as the Coupé, with Performance and Luxury trims extending above the standard model. Two new exterior colours – Belize Blue and Aztec Gold – have been introduced for the new Spider among a palette of 23, one of which is Supernova Silver, a Heritage colour that was first available on the McLaren 12C. The McLaren 720S has established a reputation in Coupé guise for its ground-breaking design, cutting-edge technologies and ferocious pace, complemented by a breadth of ability and sophistication that delivers everyday usability belying its extreme performance status. The new 720S Spider, which is available to order now from £237,000, is the equal of the Coupé in every respect.